COULD HELP SOMEONE LIKE ASHLEY? Life was just beginning to get really interesting when I was diagnosed with an 80% blockage to my left anterior descending artery. Due to its rather tricky position it required a bypass graft (rather than just a stent). I have always been fit and active, and I still am. At school and university I played representative level rugby and since leaving school have been an avid cyclist. I was not your typical heart surgery candidate. It was whilst cycling in October 2006 that I started to notice a pain in my chest which I put down to indigestion. The pain got worse over the ensuing months so I went to see my GP who, “to be on the safe side” immediately referred me to a cardiologist. I had a number of tests and at each stage the response was the same, “you are a fit young man, what are you doing here”. The angiogram proved what everyone had feared, that there was a significant blockage in an artery going into my heart. Within two weeks of the definite diagnosis and less than two months after my first visit to the GP I was being prepped for a surgical procedure that most of us associate only with those overweight and over 60. The surgery was a success and I was back home after four days in hospital. As anyone who has been through an open heart procedure knows, the surgery is the easy bit for the patient. The tough bit is healing. My son didn’t understand why I couldn’t pick him up. I had to get used to not doing anything for myself and was under strict instructions to not go near the office for what seemed like an eternity. However, within six weeks of leaving hospital I was back on my bike, playing with my son and back at work. It sounds clichéd but coming through a procedure like this makes you re-evaluate your life, old problems and worries fade and a new and improved enjoyment of the simple things in life become the norm. My wife and I now have a nine month old daughter to keep our son entertained, our architecture practice is thriving and we are enjoying an active and healthy life. I cannot quantify the gratitude that I feel towards the team of people, from my GP, to the Cardiovascular team that performed the surgery, to the nursing staff in the Intensive Care Unit, all of whom made it possible for me (and countless others) to have a second chance at life. However, aside from my extreme gratitude, there are still many questions. There is much they already do know of course. Don’t smoke. Don’t be overweight. Don’t have a history of heart disease in your family! The knowledge and skill that has been developed by The Baird Institute and others in this field has directly and unbelievably benefited me and my family. 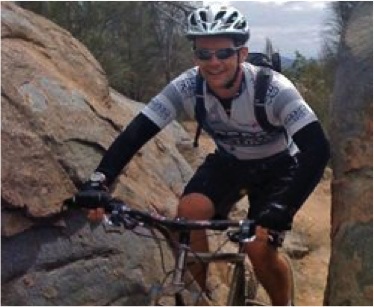 In 2009 Ashley decided to enter the Anaconda Enduro race to raise money for The Baird Institute. “I wanted to give something back. I wanted to do something that really demonstrated how successful my surgery was – and to get across the message that heart surgery is life saving and can be necessary for anyone at any age! So I entered a five day mountain bike race in the desert around Alice Springs! The Anaconda MTB Enduro – Red Centre. For better or for worse I entered with the intention of finishing the race; raising the profile of The Baird Institute and its work and most importantly to raise as much money as I could. Oh, and ok, I might have had a bit of fun in the desert doing one of my favourite things!! Because of The Baird Institute’s research into surgical techniques, patients like Ashley Dunn benefit from less invasive surgeries and are able to recover faster and get back to living their lives.